Aspen assisted the California Energy Commission with the Staff Assessment for the Genesis Solar Energy Project. The Aspen Team is responsible for the evaluation of Air Quality, Alternatives Assessment, Biological Resources, Cultural Resources, Geology and Paleontology, Hazardous Materials, Land Use Assessment, Public Health, Socioeconomics, Visual Resources, Waste Management, Water and Soil Resources, and Worker Safety. 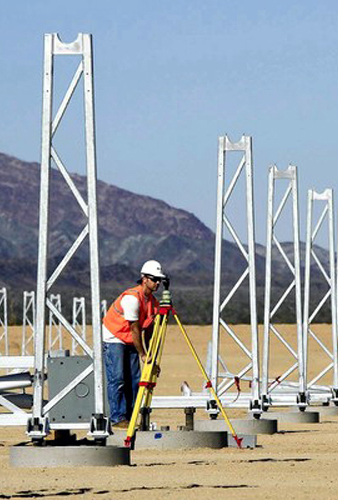 The project is a concentrated solar electric generating facility that is located in Riverside County, California. The project consists of two independent solar electric generating facilities with a nominal net electrical output of 125-MW each, for a total net electrical output of 250 MW. Electrical power will be produced using steam turbine generators fed from solar steam generators. The solar steam generators receive heated transfer fluid from solar thermal equipment comprised of arrays of parabolic mirrors that collect energy from the sun. The project uses a wet cooling tower for power plant cooling. Water for cooling tower makeup, process water makeup, and other industrial uses such as mirror washing is supplied from on-site groundwater wells. Project cooling water blowdown is piped to lined, on-site evaporation ponds. The project is located approximately 25 miles west of the city of Blythe, California, on lands managed by the Bureau of Land Management.